For convenience sake, many users like to dump their working files, program shortcuts, folders, etc into their desktop. Whatever files, programs, email attachments, etc received would be saved directly to the desktop as they think this saves time and hassle from browsing for other folders. Dumping everything to the desktop is not advisable as this could totally mess up the whole desktop screen. Soon users would have difficulty to locate the appropriate files from the screen. The sweet and pretty family photo wallpaper will also be covered up as well. If you tend to have this habit and the desktop is pretty messy now, probably you need a desktop secretary called Deskcretary to assist you. Of course Deskcretary is not a slim and Blondie chick but it is a free application which helps users to organize and manage their messy desktop. This application allows users to perform manual and scheduled desktop cleanups to keep the desktop files in order and neat. With the built in Deskcretary Explorer, users can easily view, search and restore those archived files based on file type and date archived. It saves users time and reduces the hassle of looking for files when users are in a hurry. Deskcretary is a free program which is compatible with Windows XP and Vista. This application can be downloaded via the link here. Once it is installed, this application will create a folder called Deskcretary on the desktop. The Deskcretary folder will keep all the archived files and folders and categorize them accordingly: image files, compressed files, text files, application files, etc. Users can either use the Windows explorer or view the folder directly, or alternately, use the built in tool, the Deskcretary Explorer, to explore the files. This Deskcretary Explorer program allows users to browse the files in accordance to type or date archived. Users can restore any file which is kept in the Deskcretary folder to its original file location by clicking on the Restore command. 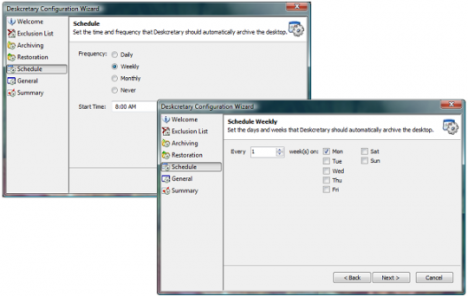 If users have some files and do not want them to be included in the Deskcretary folder, the Deskcretary program allows them to do so via its excursion list feature.